The Department of Defense (DOD) has indicated that the Clark School has been successful in securing a Multidisciplinary University Research Initiative (MURI) on Rotorcraft Brownout. The brownout phenomenon causes accidents during helicopter landing and take-off operations in arid desert terrain. 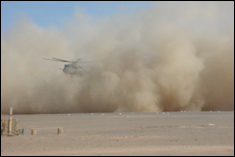 Intense, blinding dust clouds stirred up by the helicopter rotor downwash during near-ground flight causes significant flight safety risks from aircraft and ground obstacle collisions, and dynamic rollover due to sloped and uneven terrain. Please join us in congratulating Dr. J. Gordon Leishman and his team of faculty in both aerospace engineering and mechanical engineering for putting together a successful proposal on the topic "Rotorcraft Brownout". This will be a very exciting project that will lead to a new understanding of how to combat Helicopter Brownout for AFOSR.